Graphic design services beyond your imagination. 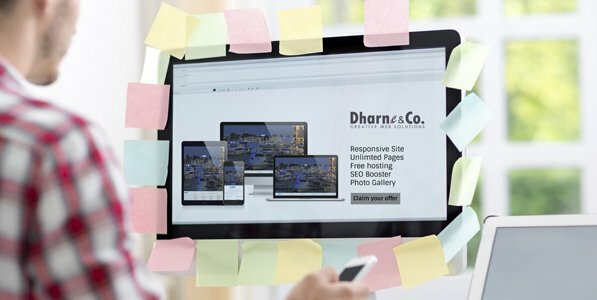 Dharne and Co. is a professional graphic design company in Orange County, CA offering Branding services through captivating designs that uniquely represent the face of your business. There is a lot more to crafting a brand's visual identity than just placing its name in a square and calling it a Logo. Often a company's first impression, one that can impact a customer's brand perception, purchase decisions and overall attitude toward a product or service resonates in its Logo design. Business logo is one of the integral element that carries the brand name and face of your business. Creating an effective logo design that represents the true essence of your business is an integral part of our graphic design or branding services. Dharne and Co. based out of Orange County, CA has no dearth of highly skilled graphic design workforce who have the ability to make custom design business logos with incredible appeal and aesthetics. We offer effective branding solutions for businesses with our creative logo designs. Custom Logos designed by us will enhance your brand perception and will help in sustaining and building the brand image. A well designed brochure or business flyer has the ability to showcase services, products and accomplishments of a business without losing the attention of your Audience. Brochure Design is one of our integral graphic design and branding services to help you reach the key audience with your business objectives. We are here to deliver what each business needs – A professional Brochure Design. At Dharne, our creative team of graphic designers takes under 3 days to ideate the initial custom brochure design. It involves our second to none iterative interaction process while integrating your requirements and our expertise. By the 5th day we present the final brochure design that will surpass your expectations. Email/Newsletter marketing ensures more than 86% returning customers. Email marketing is about building relationship with your customer. New and old customers alike can be targeted by email or newsletter blasts. Our custom newsletter design adheres to the required standards. The newsletter we design is compatible across all email services and browsers as well. Dharne and Co. has been at the forefront of Custom Email Design Companies in Orange County, CA. Our proven branding strategy comprises of creative, unique and effective newsletter designs. Our extensive experience in Custom Email Design will enable you to engage with your customers en-mass without crossing the delicate line of spamming them. Trust us to ensure maximum customer engagement through email marketing.